This is one of those shirts that frequently finds itself on those lazy 'worst football kits' lists that get trotted out by the papers every season when one club or another releases something different. In addition to this, it's whole concept could be described as at the extreme of superfluousness, so why is it not only in the Top 50, but also in the Top 10 Greatest Football Shirts Ever? 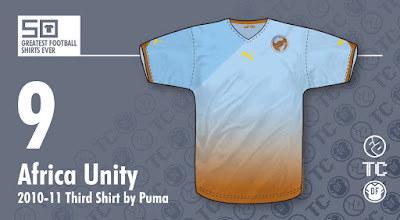 One: Purely on aesthetics / design - Coming in the form of the standard Puma template for all the African teams at the time, it's rendered in sky blue, fading down into brown. Now, aside from these both being quality colours (check out the Attic logo), I'm a sucker for a fade effect. The colours aren't just a matter of whatever the designer fancied that day, they actually have meaning - the sky blue representing the African sky and the brown the African soil. A nice touch and one with some actual thought behind it. Two: The concept. No I don't mean the sky / soil thing. The idea behind this kit's existence was peace and unity. As the title suggests, this was an African kit - Africa, of course, being a continent and not a single nation. The shirt was therefore designed to be worn by ANY African country* as a third shirt and indeed, the replica versions came with iron-on crests for all African nations*. 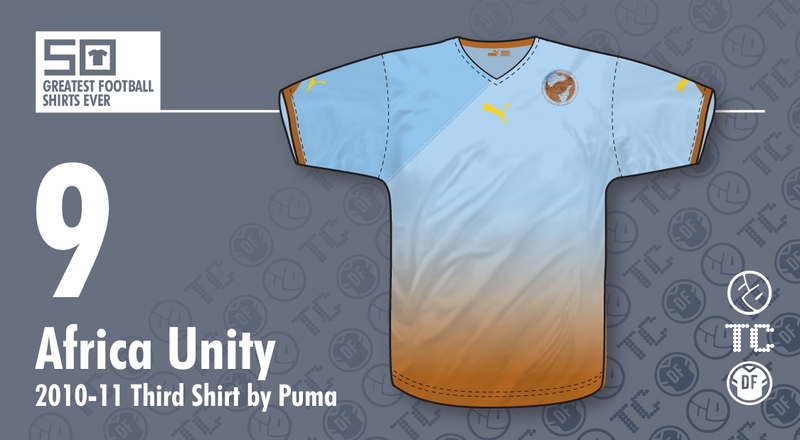 As it turns out, the shirt saw hardly any action, being used in only a handful of games, usually friendlies, so when it came to the ideal world stage of the 2010 World Cup, the first ever held in Africa, the kit, and with it the grand ideal of African unity, was nowhere to be seen.